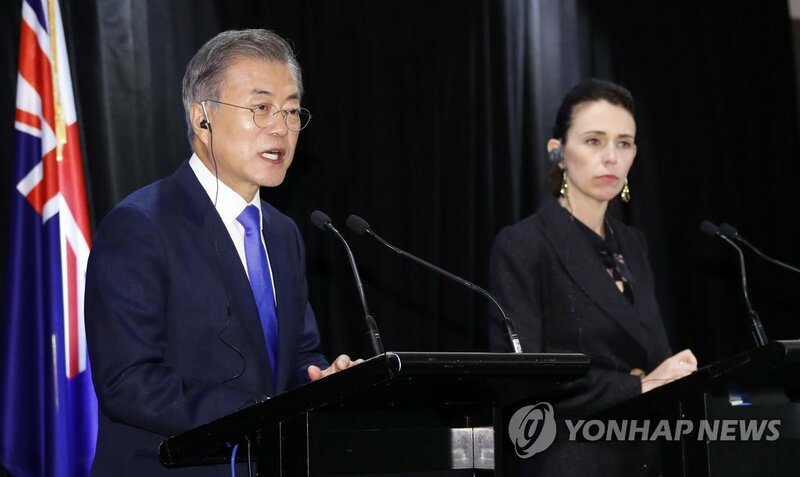 AUCKLAND, Dec. 4 (Yonhap) — South Korean President Moon Jae-in on Tuesday highlighted the importance of a proposed visit by North Korean leader Kim Jong-un to his country, saying it may help speed up the North’s denuclearization process. Moon said the proposed visit may also help ensure greater success in the second U.S.-North Korea summit, expected to be held early next year. “There is a possibility that Chairman Kim Jong-un’s Seoul visit may be made within the year,” the president said in a joint press conference, with New Zealand Prime Minister Jacinda Ardern, held shortly after their bilateral summit in Auckland. “But what is more important than whether the visit will be made within the year or not is that Chairman Kim’s visit to Seoul may further promote North Korea’s denuclearization and lead to greater progress,” Moon told the press conference. The South Korean president is on a three-day state visit to New Zealand that began Sunday. Kim agreed to denuclearize his country in his three meetings with the South Korean president this year, as well as in the first-ever U.S.-North Korea summit held in June. U.S. President Donald Trump has agreed to meet Kim for their second bilateral meeting. Moon said he will seek to ensure the success of the second Trump-Kim meeting, should Kim decide to visit his country before the U.S.-North Korea summit. He said Kim’s trip to Seoul, if made, will also be a historical event in itself, noting no North Korean leader has visited the South Korean capital since the division of the two Koreas in 1948. The two Koreas technically remain at war as the 1950-53 Korean War ended only with an armistice.